The trip to Yachana Lodge did not start very well. Our flight to Quito from Cuenca was late by over an hour, we missed our reserved cab, we hailed another taxi driver who started a row with another driver over some perceived infraction, and then the drive to the hotel took a long time, even though we were hanging on as the driver tore through the streets at full speed, honking at other cars all the while. All things considered, we lost some of our expected time for touring, but we did make it to the hotel. Once we were at the hotel, however, things perked up. The hotel -- The Hotel El Relicario del Carmen -- is a sanctuary even though it's only a block from the busy center of the historic district. The building itself was built in 1705 but has recently been beautifully renovated and was very comfortable and unique. The place is highly recommended. Since Randall had not been in Quito before, we went to the nearby Independence Square – Randall visited La Compañia (The Chuch of the Jesuits) that has the very ornate laminated gold surfaces, Plaza de la San Francisco (building started in 1540), and Iglesia del Sagrario (Church of the Sacrarium) located on one side of Independence square and the church with the squeaky floors. After finishing with the churches, we took a taxi to the Artisan’s Market on Jorge Washington Street, did some walking in the Mariscal district and looked at some other Artisan shops. We finished the evening at the English Pub on Reina Victoria which happens to be owned by the Yachana Foundation (the foundation had purchased space for offices and the pub came with the building) and the founder Douglas McMeekin was in Quito and he visited with us. The next morning we were at the VIP airport, and we waited with the oil workers for the plane to Coca (one and a half hours late). After a 30 minute flight, we changed altitude from 9200 feet in Quito to 800 feet in Coca. 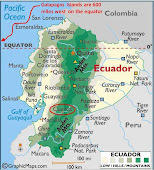 Subsequently, we received the description of Coca as being “a town of hotels and bars” as it is the entry point for oil workers into the interior. Our guide from Yachana was there to greet us, and we embarked on the Evinrude-powered canoe for our ride upriver on the Rio Napo. The ride was a bit over three hours and was enchanting. Randall tries to convince his father to buy a hat at the Quito Market. All on board the canoe for the Yachana Lodge. 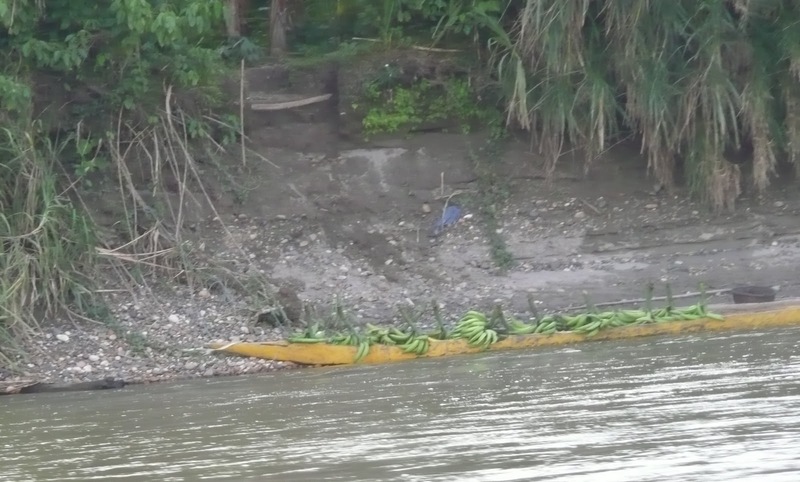 A view of the Rio Napo as we head upriver. Typical view of the landscape. Canoe waiting for its owners. One of two ferries to cart oil vehicles across the river. The river floods majorly twice a year and bridges would be a huge investment. A second ferry carting a pickup across the river. A canoe with some of the local produce. 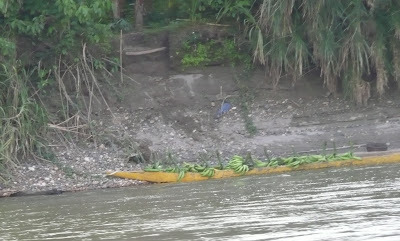 We made it to the lodge, and we enjoyed the view of the Rio Napo.